The day wasn't over yet. John glanced at his watch. It was 2:30 AM. 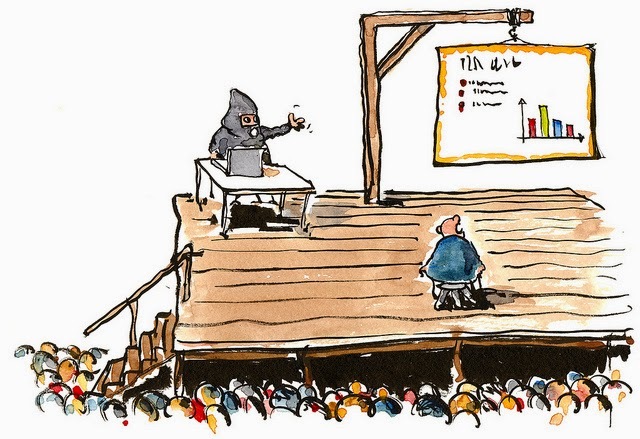 He had just finished proofreading his presentation for later that day. He couldn't believe it took him this long. To hell with Parkinson's Law! He sat motionless in his desk, too exhausted to hit the bed. He badly wanted some fresh air. His hands sought no permission from him and clicked open the Tweet-deck App. He scrolled through the tweets gushing out of the window. When he first saw the tweet, he choked. Was it meant to be a joke? He zoomed over to see if the tweet was still there just the way he read it few seconds ago. John: Hi! I am John. Did I read your tweet right? I first thought I read, “How to save the world with knowledge?” Is this a zen joke or something to invite a consultant – someone who sells his expert advice by the hour– to listen to your “save the world from knowledge” pitch? N.Mystic: That is precisely the point. Let me get this straight. I have no interest in this saving/changing the world business. Those are silly advertising slogans. I simply played by the rules of Twitter to see if I can engage with someone who takes his knowledge seriously. N.Mystic: I don’t need to. You do, don’t you? John: Yes, I do. My expert advice is always backed by impeccable research. I constantly learn from frameworks old and new; hunt for interesting case-studies. I back my recommendations with references from leading experts in my field. 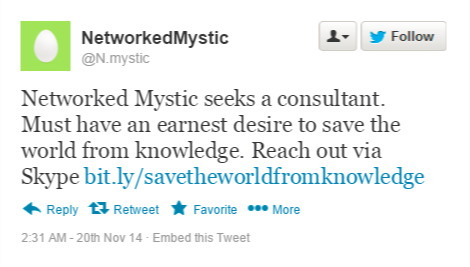 N.Mystic: I don’t doubt your knowledge. Although I wonder how close your knowledge brings you to the truth. John: Look, I don’t know if you are familiar with consulting. My clients are not into truth business.They simply want answers to their problems. N.Mystic: And your answers solve their problems? John: Yes….. but… to be fair, more often, to the extent how the client defined their problem in the first place. It always puzzles me how clients label their problems by the hottest trends predicted by the Analyst sector. N.Mystic: I see. So you’re aware that your answers could have led to unintended consequences unnoticed by the client. John: Oh Yes! But that’s how the game perpetuates itself. By the time I warm up in my relationship with the client, to give him that painfully honest advice which matters, I move on with my next consulting assignment. But things are changing, for good I guess. Consulting industry is getting disrupted. “Experts” can no longer afford to sit in their halos. We are beginning to tap in the wisdom of the crowds. You use Twitter. I am sure you appreciate the enormity of change that’s happening. N.Mystic: Well, I do. I am sure you are smart enough to know that lack of information is not causing the problems faced by organizations. Why don’t you tell me from your experience? Whenever you think deeply over a problem, does it narrow or broaden your perspective? John: Of course, It broadens my perspective. I read and write a lot. It helps me immensely to appreciate the problem at hand and provide an informed opinion about it. N.Mystic: That’s interesting; because, I’ve realized to the contrary, how reading and writing have limited my ability to see a problem as it is. John: Are you kidding? Are you saying reading and writing is bad? Especially in this age when attention has sunk so badly that many cannot even read a 500-word article in one go. N.Mystic: I am not saying reading and writing is bad. It’s just that it’s limiting. After all, reading expands one’s ignorance, while writing narrows down one’s knowledge*. In the end, I am left playing with tool of language to know something , groping around in the realm of the known. John: How else can one know without taking help from knowledge that’s available? N.Mystic: If one were to only depend on knowledge to know something, by now, consulting firms would have started with T-a-a-s offerings.Thinking –as-a-service*. John smiled as he saw for the first time the dark figure letting out a wicked chortle play across his round face. John: You are an interesting person! We should catch up some time. Do you blog? I’d be curious to follow you and check out your stuff. N.Mystic: No, I don’t blog. My words die the moment they are written. I like to play around with living things. John: Living things such as…? N.Mystic: This wonderful conversation which we are having. John: Oh yes! I never expected to enjoy this conversation. I want to explore deeper into this. But, I’ve gotta go now.Talk to you soon. John hung up his skype and shut down his laptop, basking in that old feeling he used to get when he sat in his university class: A pleasant cocktail of warm emotions suffused with a delicate sense of awareness. Acknowledgement: This article is a synthesis of many conversations I have had with many friends both in the world of atoms and bits. The line on reading and writing owe its credits to Mr.T.R.Jawahar of Mylapore Talk, Chennai. "Thinking-as-a-service" term comes from Manjit Singh, my dear friend whose meditations in the Web have immensely provoked me. Special thanks to Sanjay Radhakrishnan for many delightful conversations on knowledge and reviewing a draft version of this article. Wow! Really interesting article you have here. A different take on the whole MBA approach. Thank you @Heather Jones Would love to hear your take as well!